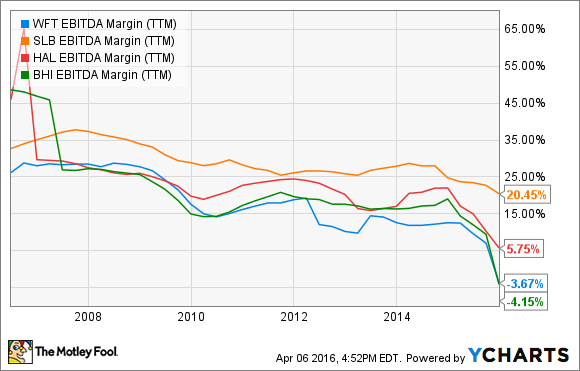 How Risky Is Weatherford International's Stock? 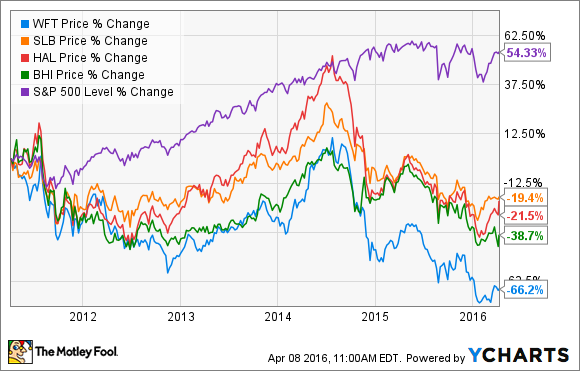 It's not the same Weatherford International of 2013, but it's still a riskier stock than others in the space. Typically, when a company is one of the top five players in a large, well-established industry, it isn't too risky of a stock. Yet if you were a shareholder in Weatherford International (NYSE:WFT) over the past couple years, its stock's performance might make you think otherwise. With the oil market in the dumps, there isn't a whole lot oil-field services companies like Weatherford can do to improve their situations. Beyond the typical ups and downs of the oil market, though, how risky can Weatherford's stock really be? Let's take a look at the risk you may be getting into if you were to buy its shares. If you had asked this question a couple of years ago, the answer would have likely been "Yes, it's pretty risky." The company looked like a wreck. It had gone through several restructurings that included moving its corporate headquarters from the U.S. to Switzerland in 2008, then from Switzerland to Ireland in 2014. All the while, the company was taking billions of dollars worth of what it called one-time charges that, over the course of 4 years, totaled $3 billion. 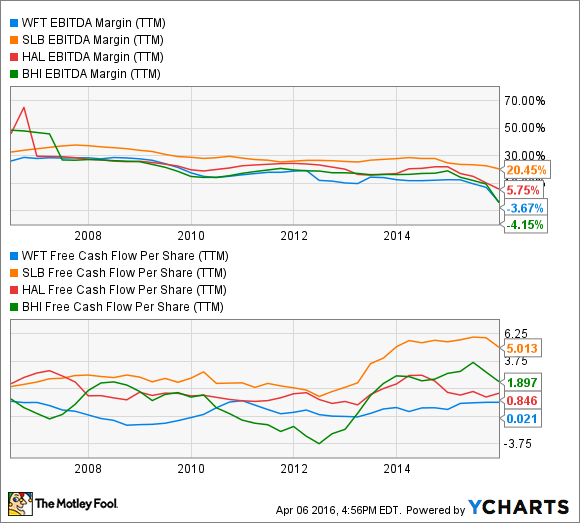 WFT EBITDA Margin (TTM) data by YCharts. Its debt load was also a major drag on any chance at profitability. Just as the company was starting to lower its costs, the oil crash hit, and it forced severe cost-cutting measures. Between 2013 and today, it has cut its workforce in half, to 33,000 employees, and has enacted $2.5 billion in cost cuts. As much as those measures have looked bad now, they have been a bit of a blessing in disguise. The deep cuts that the company was forced to take actually helped it to generate free cash flow for the first time since 2010, and the annual cost savings should also allow it to generate a decent amount of cash in 2016 as well if things go according to plan. What is even more encouraging about this is that, instead of doing something silly with the money like buy back shares or pay a dividend, the company is looking to deal with its other problem of too much debt. The plan right now is to use the free cash flow generated and start paying down its debts, many of which are due between now and 2019. It has also recently raised about $630 million from issuing new equity that it plans to use to pay down debt. It may have taken Weatherford a while to get back on the right path toward profitability, but the moves it has made have led it to be a much less risky investment than a few years ago. As much as Weatherford has been able to improve its financial position and turn into a profit-generating machine, the company is still not as well positioned as its major oil-field services peers. Internationally, the market is pretty much dominated by Schlumberger (NYSE:SLB), which -- when you include the recent Cameron International purchase -- is the top service provider in 16 of the 21major offerings that the company has. At the same time, both Halliburton (NYSE:HAL) and Baker Hughes (NYSE:BHI) are big-time leaders in the North American market and doing the drilling work needed for shale wells. What will make it more challenging for Weatherford to break out of its current position is that the other, bigger companies have greater economies of scale. With demand for oil-field services so weak, the likes of Halliburton and Schlumberger can jump on the chance to capture even more market share while Weatherford may not have the financial firepower to counter such a move. Also, the company isn't out of the woods yet when it comes to its balance sheet, and a long period of weak demand could keep straining Weatherford's finances. To some investors, Weatherford International may look like a compelling turnaround story. The company is finally making the deep cuts to its cost structure that were necessary to stop the operational losses and clean up the balance sheet. If these trends continue over the next several quarters, it will be a heck of a lot less risky than it was even a year ago. At the same time, it is still a pretty modestly sized fish in a pond that has two orca whales swimming around in it that can throw throw their weight around. This makes Weatherford's stock a little riskier than those of its peers. If you are looking for a solid investment in this space without too much risk, it's probably better to look at one of Weatherford's larger competitors.